The June-July Arvada Report carried an unsigned article titled “Rocky Flats and the Jefferson Parkway ­ Is it safe?” The article says, yes, it’s “safe.” But “safe” for whom? Certainly not for the most vulnerable among us for at least three big reasons: 1) the danger of plutonium, 2) the inadequacy of official standards for permissible exposure, and 3) uncertainties about environmental conditions at Rocky Flats. The principal contaminant of concern at Rocky Flats is plutonium. An unknown quantity of plutonium in the form of minute particles remains in the environment at the site. 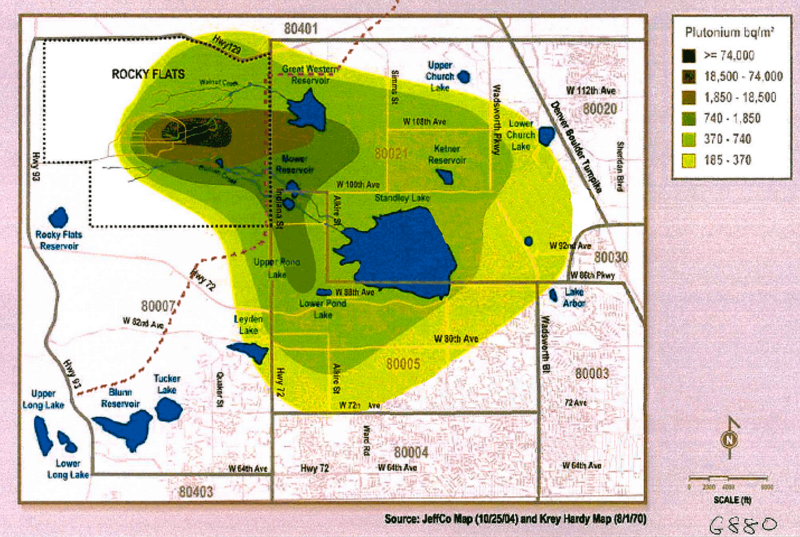 The determining factor in whether to build the Jefferson Parkway along the edge of the Rocky Flats site should be the plutonium that is known to be there. Scientists from the Atomic Energy Commission (predecessor to the Department of Energy) produced the map below in 1970. 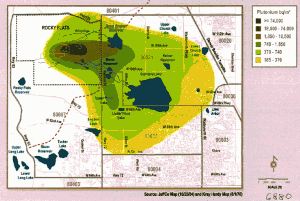 It shows where plutonium released from Rocky Flats up to that time was deposited on and off the site. The proposed Jefferson Parkway, indicated as a dotted red line, would pass through the heart of the contaminated area. To put these numbers in perspective, it helps to compare them to naturally occurring background radiation. Humans have always lived in an environment of naturally occurring radiation. Some become ill, some die from exposure to naturally occurring radiation. Natural background radiation includes no plutonium. But plutonium is now part of background radiation globally because of atmospheric nuclear detonations. Our environment worldwide has been permanently modified. Both the late Edward Martell of NCAR and the dissident Soviet nuclear physicist Andrei Sakharov asserted that some people would become ill and die due to exposure to radiation added to background from human sources. The average background level of plutonium from global fallout along the Front Range of the Rockies in Colorado is 0.04 pCi/g. The 50 pCi/g of plutonium allowed to remain in the top 3 feet at Rocky Flats exceeds the 0.04 pCi/g average background level by 1,250 times; the 1,000 to 7,000 allowed at a depth of 3 to 6 feet exceeds the average background by 25,000 to 175,000 times. The National Academy of Sciences report on Health Risks from Exposure to Low Levels of Ionizing Radiation (2006) categorically affirms that any dose of radiation is potentially harmful. Standards for permissible exposure, such as those applicable at Rocky Flats, do not reflect this reality. The British Committee Examining Radiation Risks of Internal Emitters concluded in 2004 that cancer risk from very low-doses of plutonium may be ten or more times more dangerous than allowed for by existing exposure standards. Exposure standards do not protect the most vulnerable members of a population. The cleanup was done on the assumption that plutonium left behind at Rocky Flats will be “relatively immobile.” But in the unusually wet spring of 1995 environmental engineer M. Iggy Litaor, who had been employed at Rocky Flats for ten years, with instruments set up in the field on site, detected significant migration of plutonium in subsurface soil. His stunning discovery countered the Rocky Flats orthodoxy. He was very quickly terminated. In 1996 ecologist Shawn Smallwood identified 18 species of burrowing animals at Rocky Flats. All constantly move soil and any adhering contaminants. Some burrow down 10 to 16 feet and in any given year disturb 11 to 12% of surface soil at the site. Plutonium, which was partially removed to a depth of 6 feet and not at all below that, is being constantly re-circulated. Material brought to the surface can be carried by wind both on and off the site. Smallwood’s study was totally ignored by those responsible for the Rocky Flats cleanup. The FBI raided Rocky Flats in 1989 to collect evidence of alleged environmental lawbreaking at the plant. A special grand jury spent nearly three years reviewing the evidence. As part of the out-of-court settlement, the judge sealed 65 cartons of data from the case. Do these cartons contain evidence of environmental contamination that should have been reviewed by those responsible for the Rocky Flats cleanup? That the grand jury opposed the settlement and wanted several plant officials indicted indicates that such review should have occurred. Yet the agencies that regulated the cleanup never reviewed these documents. Construction of the Jefferson Parkway at Rocky Flats would stir up particles of plutonium, endangering all who breathe but most especially the most vulnerable among us. The most vulnerable, without question, is a human child, who is more likely than an adult to breathe in gasps, to eat dirt, or to scrape a knee or an elbow, all ways of taking tiny particles of plutonium into the body. 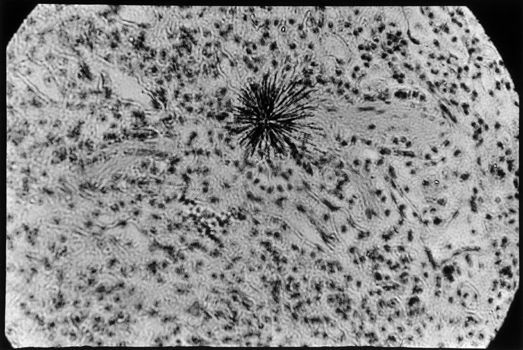 Because of the smallness of a child’s body, internalized plutonium is more likely to integrate with rapidly developing tissue. Moreover, the child’s normal life span provides far more time for internalized plutonium to harm her or his health. Constructing the Jefferson Parkway poses risks that should not be taken. Previous Topic: Separate But Equal?